Farm Bureau members can ship fresh Florida citrus and other Farm Bureau gift products to family members and friends across the country! Citrus gift packs in season, Chocolate-Covered Pecans, Whole Roasted Cashews, Southern Fried Peanuts and more for Christmas, birthdays, special holidays, or just a gift for a special friend. Contact your county Farm Bureau office or call 877-787-5004 (M -F, 8 am – 4:30 pm) or visit FloridasBestFruit.com. 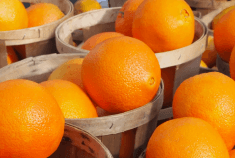 The Florida Farm Bureau Fund Raising Division markets fresh “Florida’s Best” ® citrus and other agricultural products to fundraising organizations across the country (i.e. FFA Chapters, 4-H Clubs, School Bands, Lion and Kiwanis Clubs, etc.). Call 1.800.654.0941 for more information on gift fruit, citrus, nuts, beef jerky and other fundraising opportunities or visit fwffb.com.